In Switzerland during WWII, it was illegal to use powered aircraft to aerotow gliders and they could only be launched by winch or a bungee catapult. However, only a few areas were de-restricted for military reasons and so it was impossible to carry out distance flights and pilots learned to maximise their flights through slope lift and the Moswey series was able to exploit this. In 1937 the Moswey II was among the types participating in the first International Competition to be held at the Wasserkuppe in Germany. The Moswey III (14 meter span) was fitted with air-brakes and differed from the Moswey II (13.8 meters) which used spoilers. 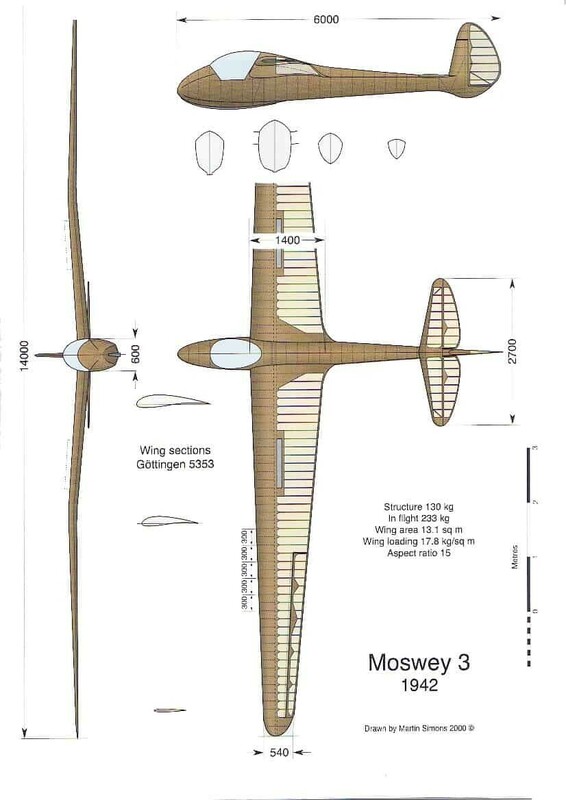 The Moswey IIa did have its’ span increased to 15.19m, but it was decided to keep the Moswey III down to 14 meters for aerobatic purposes. The Moswey IV increased its span again to 14.4 meters and had a deeper front fuselage in order to house a retractable wheel. . The Moswey III is a Swiss built mid mounted gull wing, single-seat glider that was designed by George Müller at the headquarters of Moswey Segelflugzeug-Werke. 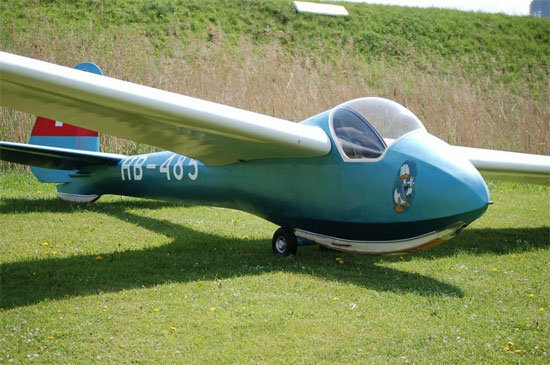 It was extremely elegant in design, utilising a very short nose and was licensed built by the carpenter, Walter Hegetschweiler of Horgen, where eleven of these gliders were built during 1943/44 out of a final total of fourteen. They were of lightweight construction and were to prove ideal for launching from slopes, particularly in the high Alps, where they would be transported on the mountain railways towards the summit and carried the rest of the way to the slopes. The aircraft is of conventional plywood and fabric construction. The front fuselage is of a hexagonal section transforming to a diamond section at the rear fuselage and is built upon a main keel beam that also contains the control runs. The 14.0 m span wing design used a Goettingen 535 airfoil, with schempp-Hirth style air brakes for glidepath control and utilised slotted ailerons to provide a good roll rate without adverse yaw. The structure is stressed for aerobatics to +/-12g. 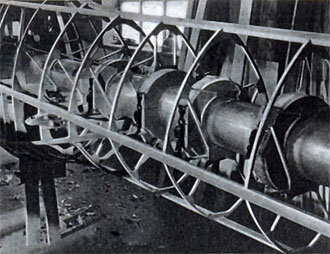 The Moswey III employed an unusual method of fuselage construction, being built around a large tube, which was removed after construction. 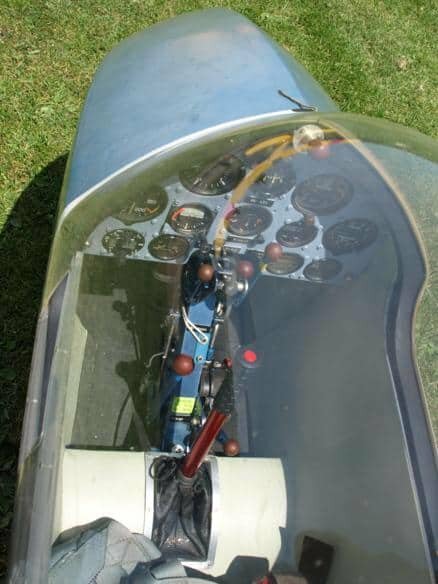 Push-pull control rods were installed to give the precise control needed for aerobatics, whilst the blown bubble canopy gave excellent visibility. The cockpit was quite small, with the wing roots providing the extra space for the pilot’s shoulder and elbows or as a storage area, used sometimes for carrying Oxygen bottles. The rudder pedals were adjustable !n flight by means of a screwed rod with a crank handle. The Moswey III is the star of George Müller’s constructions. Especially noteworthy was the maneuverability and its good-natured behavior and could easily out perform the larger gliders in competition by being able to turn inside them in a thermal. 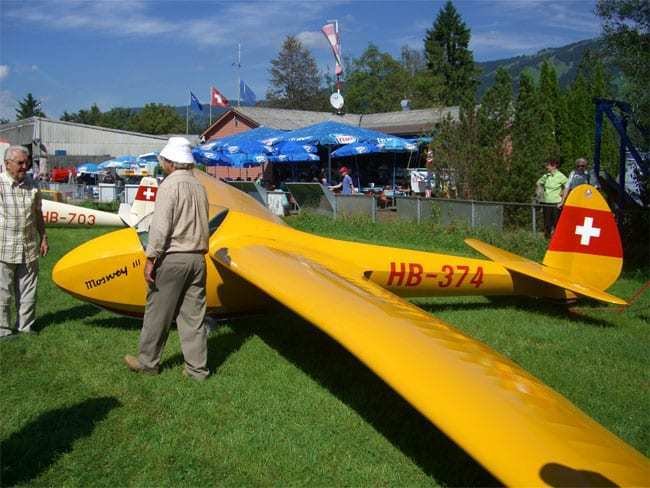 In 1948 a glider, piloted by Alwin Kuhn, took third place in the World Championships at Samedan in Switzerland and that same year one flown by Siegbert Maurer made the first crossing of the Alps from South to North. 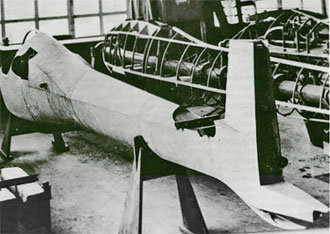 After the war a Moswey III set the first world record for speed over a 100km triangle and captured most of the Swiss national records of early postwar years. 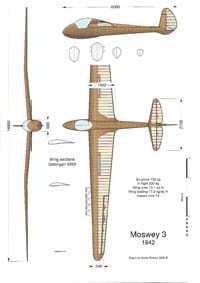 The drawings of all Moswey sailplanes were given to the Swiss Aero Club and copies were later sent to the Vintage Glider Club where they are still available to members.